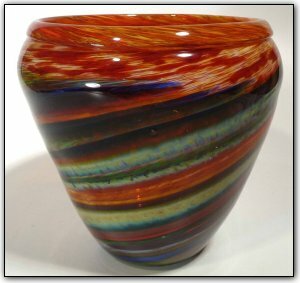 This vessel can function either as a vase or a tall bowl, and was made from hand pulled canes of brightly colored glass. The outside features many lovely colors of the rainbow with an elegant orange collar on top, and the inside features deep and luscious shades of orange. Working with canes is a two stage time consuming process, first Dirwood hand pulled the canes used to make this bowl then he made the bowl using those canes. Make sure to zoom in to see just how deep and lovely these colors are!